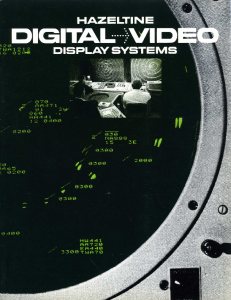 A brochure from July, 1968 for Hazeltine’s Digital Video Display Systems outlines the architecture of the systems known as the Alpha-Numeric Generator (ANG-1, ANG-2, ANG-3) and Digital Display Generator (DDG). The design of these systems began in 1962. The ANG-3 was deployed for FAA air traffic control centers in New York, NY (John F. Kennedy International Airport), Jacksonville, FL, and Atlantic City, NJ. The ANG-1 and ANG-2 predecessors were deployed to the Georgia Air Traffic Control Terminal in Atlanta, GA. The DDG-1 was deployed at Cape Kennedy, FL as part of pre-launch checkout of space rockets and feeds video signals by microwave to NASA’s Manned Space Flight Center in Houston, TX. The DDG-2 was installed at Brookhaven National Laboratory in Long Island, NY as part of it’s research facility. This is an interesting system for it’s time and clearly a big ticket item and not something intended for individual use. The display system consists of three major subsystems: a data processing unit, a picture assembly unit and a picture refresh unit. Operator input from controls located at the display (keyboards, switches, etc.) is fed back into the data processing unit where it is made available to the host computer and is fed into the picture refresh unit to control on screen cursors. The data processing unit is a bidirectional interface to a host computer where operator input can be obtained by the host computer and commands for constructing display images can be given to the display system. The picture assembly unit converts high level commands into low level pixel operations and renders them onto core memory. The completed image is then transferred from the core memory to the picture refresh unit. The picture refresh unit continuously scans out the refresh memory and generates video signals from the bit patterns. Similar subsystems appear in a modern graphics card but they have substantially more computing power and memory capacity. The last two pages of the brochure show pictures of a wide variety of displays that Hazeltine manufactured for the United States military. Until reading this brochure, I only knew of Hazeltine Corporation as a manufacturer of video terminals. (The museum currently has 6 such terminals in it’s collection, models 1200, 1400, 1500 (x2), Esprit and Esprit II.) Apparently it’s terminal products grew out of it’s experience manufacturing digital displays as a defense contractor. The displays shown on the final pages of the brochure have a certain “mad scientist” Hollywood set appeal to them. Given their age and defense nature, it seems unlikely that any of these displays have survived. The second addition of note is a brochure for the Intecolor 8000 Series Color Terminal. 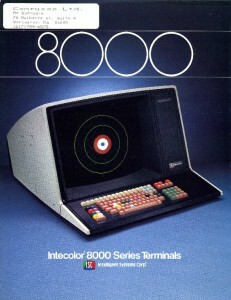 The Intecolor 8000 Color Terminal was a product of Intelligent Systems Corporation. Peripheral Exchange is a company that, as of 2012, still services ISC products and they have an interesting history of ISC on their web site. I had been reading on a vintage computer collector’s web site that claimed the Tektronix 4027, introduced in 1979, was the first commercially available color raster graphics terminal. It’s true that the 4027 was the first color raster terminal offered by Tektronix, but as is so often the case with various claims of “firsts”, there is usually a lesser known manufacturer of products that was the first to enter a market. In this case, we’re interested in a rather specific “first”: it must be a terminal and not a dedicated peripheral for a host computer like the Hazeltine products mentioned above. It must be a raster display terminal, not a vector display terminal like the Tektronix 4002 introduced in 1969. It must be a color raster terminal, unlike the Tektronix 4025 black and white raster graphics terminal introduced in 1978 or the Hewlett-Packard 2648A black and white raster graphics terminal introduced in July, 1977. A quick post to the cctalk mailing list revealed information about the ISC Intecolor 8000 series terminal and an advertisement for that terminal that appeared in BYTE magazine in 1976, seen at right. As mentioned in the ad, the terminal could have additional options added to it to create a home computer, the Compucolor I. It was succeeded by the Compucolor II system. This entry was posted in BitSavers and tagged Hazeltine, Integrated Systems Corporation, Terminal by legalize. Bookmark the permalink.